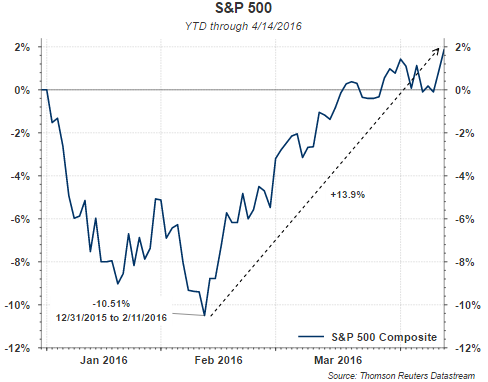 For the week ending April 8, both the S&P 500 Index and the Dow Jones Industrial Average declined 1.2%. As this week nears a close, the S&P 500 Index is attempting to recover that loss and is currently up about 1.5% for the week. Given the strength of the market advance from the February 11th low, up 13.9% at the time of this writing, surprisingly, individual investor sentiment remains cautious. In yesterday's Sentiment Survey report by The American Association of Individual Investors, bullish sentiment declined 4.3 percentage points to 27.8%. Most of this decline in bullishness was reflected in the bearishness reading that increased 3.4 percentage points. The bullishness reading came in lower than the average reading minus one standard deviation. 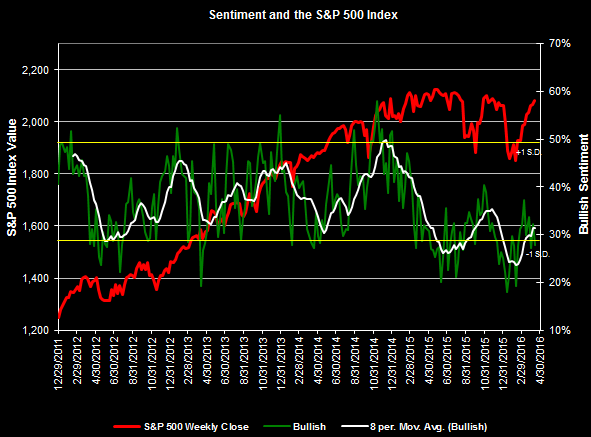 Since the end of 2014, bullish sentiment has trended lower and now appears to be moving within a lower range. 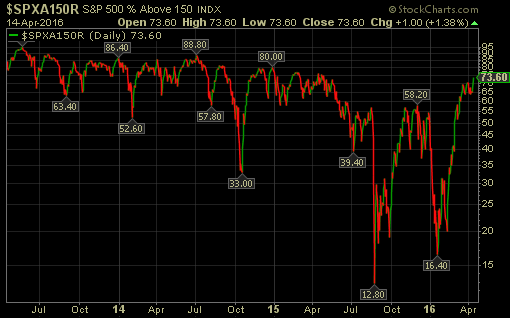 A similar result is reflected in the NAAIM Exposure Index. This index measures the actual adjustment active managers have initiated in their respective client accounts during the prior two weeks. This week's exposure of 63.97% is down from last week's 73.21%. 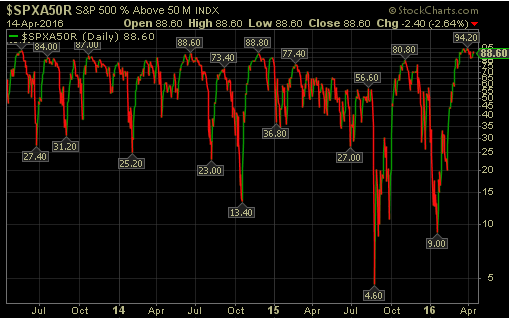 A healthy up market is one where a relatively high percentage of stocks are participating in the move higher. One way to obtain insight into this is to look at the percentage of stocks trading above their 50 and 150 day moving average. As the two charts show below, 88% of S&P 500 Index stocks are trading above their 50 day moving average and 73% are trading above their 150 day M.A. Following the first quarter of 2015, the percentage of S&P 500 stocks trading above their 150 day M.A essentially did not rise above 50% during the remainder of 2015. The narrow market of 2015 saw a handful of stocks account for a large part of the market return. In particular, the FANG group of stocks alone generated a sizeable portion of returns in 2015. So far this year, the broader participation is a healthy sign for the market. 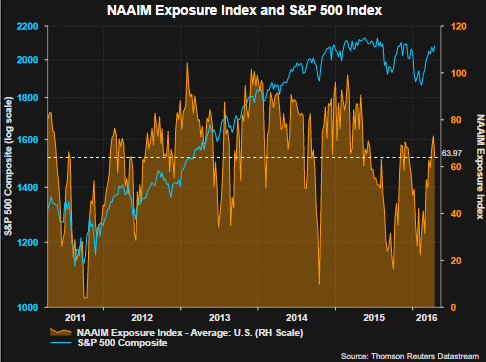 Additionally, knowing sentiment measures are most predictive at their extremes and the AAII sentiment reading is not at an extreme yet, individual investors continue to approach this market with some caution. In other words, investors do not appear to be "all-in" at the moment and this could be one factor that supports higher equity prices. all else being equal.